We’ve witnessed the creation of many recurring themes in iOS gaming. 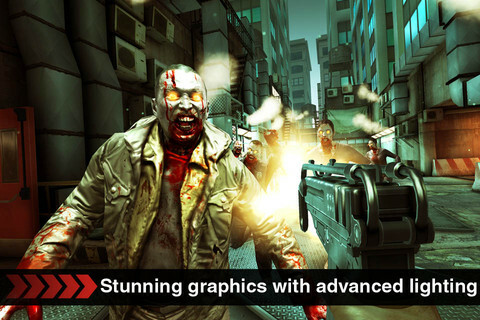 Some of these include dodgy FPS touch controls, gameplay that leans heavily on grinding “optional" IAP currency, and of course the never-ending onslaught of titles starring zombies. 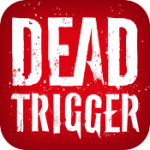 For better or worse, Dead Trigger (Free) hits each one of these themes and attempts to compensate by wrapping the package up into one of the most visually impressive games I’ve seen on the App Store. Unfortunately, its excellent implementation of the Unity engine isn’t enough to carry what is otherwise an entirely mediocre, freemium-ish zombie FPS. 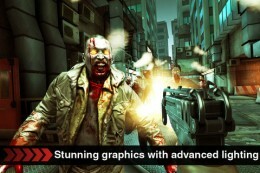 As expected, zombie killing is your primary goal in Dead Trigger. Gameplay is divided into missions, which can be selected via a top-down map of the zombie-infested city you’re stuck in. Some missions have you defending structures from the horde, other missions are survival endeavors where you fight a never-ending supply of zombies until a timer runs out, while others charge you with finding an item and returning it to the starting location (a simple “kill x amount of zombies" mission also exists). Despite the different mission structures, it’s really all about killing as many zombies as you can with the varying modes simply being vague excuses to do so. At the end of each mission, you’re awarded cash, which can be used to buy weapons and supplemental items (bandages, grenades, etc. ), as well as experience, which goes towards a perpetual level that serves as a soft wall for purchasing weapons. While Dead Trigger always has a few “story"-based missions available, there’re plenty of optional missions that pop up that allow you to earn more cash and experience as needed. Although, to be honest, I’m not entirely sure what the point of the leveling system is, as unless you’re willing to open your wallet, you’ll be grinding levels for in-game cash far longer than the required levels for weapons. Unless you really enjoy taking down large numbers of zombies, Dead Trigger quickly devolves into a simplistic freemium-based rat race where the end goal is to buy a bigger gun that lets you, well, kill more zombies. There’s little here in terms of narrative, much less a compelling one. 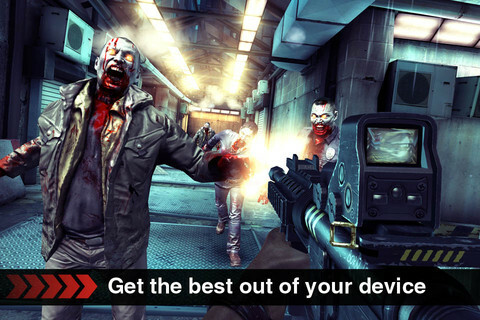 The zombie hordes don’t have much in terms of enemy variety, and the inclusion of weapons and upgrades that are restricted to only the premium currency (which is “earned" via IAP or by TapJoy-esque mechanisms) add a bad freemium taste to the experience you already paid 99¢ for- Especially as in an early mission you “lose" the rifle you start with in a cut scene. Of course, you immediately have the option to buy it back, with real money. Unfortunately, Dead Trigger’s controls act as another deterrent to enjoying the game. Movement is a bit sluggish while panning around and aiming feels jilted, even with repeated attempts at finding the soft spot on the sensitivity slider. This is amplified by the fact that zombies can, and often do, spawn behind you. Playing on the iPad in particular becomes a chore, especially with aiming. Gyroscopic assisting really needs to become a de facto option for newer iOS devices that take advantage of it, because it would have made my experience with Dead Trigger a bit less harrowing. Similarly, I really would have liked a better way to fine-tune aiming, particularly since headshots award additional cash. Thankfully, not everything is as apocalyptic as the zombie invasion you’re fighting. Dead Trigger’s visuals (courtesy of Unity) are downright amazing. The environments and units are highly detailed, there are lots of amazing almost console-like visual effects (such as water running down the HUD when you step through a stream), and even the lighting is done well. The graphical splendor feels even more magnified on the new iPad, with retina graphics that are some of the best I’ve seen on iOS so far. While the game wasn’t necessarily running at an extremely high framerate, I was more impressed by the stability of it, as I encountered little in terms of slowdown. In some ways, Dead Trigger feels more like a tech demo offering a glimpse of what’s to come in the world of iOS gaming, similar to how Epic Citadel (Free) showed off what the Unreal engine could do. The visuals are absolutely captivating, and are an excellent inexpensive way to showcase just how beautiful games could be on the new iPad. However, as a game, Dead Trigger just falls flat in terms of implementation offering the same dull freemium-based experience that we’ve seen before. As it stands, gamers that don’t mind the incredibly simplistic stylings of a monotonous mission-based race for cash will probably enjoy Dead Trigger but for everyone else, it all depends on how high nice graphics are on your priority list.